Okay, I admit it – I’m new to Twitter, and so even the most basic Twitter applet is fascinating. But I’ve found that many of these services tend to overwhelm you with the voices of all those Twitter users – and it’s hard, while watching all those different one-line opinions flash by, to get a real sense of how the majority of users really feel about a topic. If getting a real feel for what’s going on is important to you, then the folks at Waggener Edstrom Worldwide (a PR company that, perhaps not incidentally, handles a good deal of Microsoft’s accounts) have a beta Web app that might help: Twendz. What is it? Type in your search term — say, “Google Voice” — and you not only get a drop-down list of everybody’s Twittered opinions on the subject, but an estimate of what percentage of the tweets are positive, negative or neutral. What does it do? According to the About Twendz page, the app mines tweets, pulls out keywords, and compares those keywords to a collection of thousands of words that are associated with positive or negative sentiments. Each word gets a score, and using a combination of those scores, Twendz makes an educated guess as to what the tone of that tweet is. What you see, besides the list of tweets, is a trend line that shows the percentages of how people feel: red for negative, white for neutral and green for positive. (In other words, you get something that looks a bit like Italy’s national flag in reverse.) You also get a word cloud showing the most popular terms being used within those tweets. Expect a bit of lag at first. When you begin a new topic, you have to wait a few seconds for a few tweets to appear before the trend line and word cloud show up; they’re updated in real time as more tweets arrive. Let it run long enough, and you can get a timeline showing the positive/negative/neutral trends over several hours. 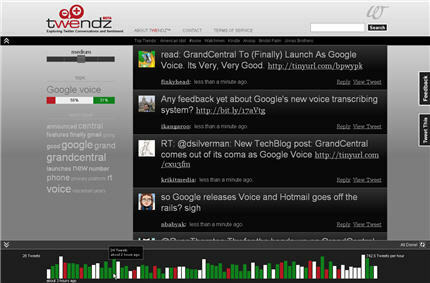 Besides the list of tweets, Twendz offers a trend line that shows you how people feel. What’s cool about it? If your business is trying to figure out what people are talking about – and whether they are happy about it or not — this is a good way to get at least an idea. What needs to be fixed? Necessarily, there are a few “buts” that go with this, especially if you’re trying to use it as a professional tool. First, we’re only talking about people who use Twitter, so it’s a pretty self-selected bunch. Then, you’re relying on the strength of the algorithms that are being used to distinguish positive from negative. A colleague did a search for “Kindle” and reported that the trend line was initially coming up mostly negative even though the tweets seemed pretty positive. She noted that one of the tweets read “I want a Kindle 2 soooo bad” and wondered whether that counted as a negative. Is the Twendz algorithm smart enough to recognize that “want” plus “bad” equals good? Finally, this is still very beta, so you may find that Twendz changes its look and feel as time goes on. Final verdict: This doesn’t have quite the flexibility and power of applications such as Twitterfall. But it gives a nice snapshot of the current Twitter zeitgeist, especially on topics you’re most interested in.